On Thursday, June 28, 2018 the Father McKenna Center hosted the play Journey to Restoration: The Father McKenna Center Way at 7:00 pm in The Father McKenna Center. 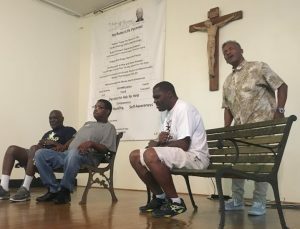 On June 28, 2018 Cortez McDaniel, the Director of Services at the Center, and four men from the program told their stories of reclaiming their lives through the intervention of the Father McKenna Center. 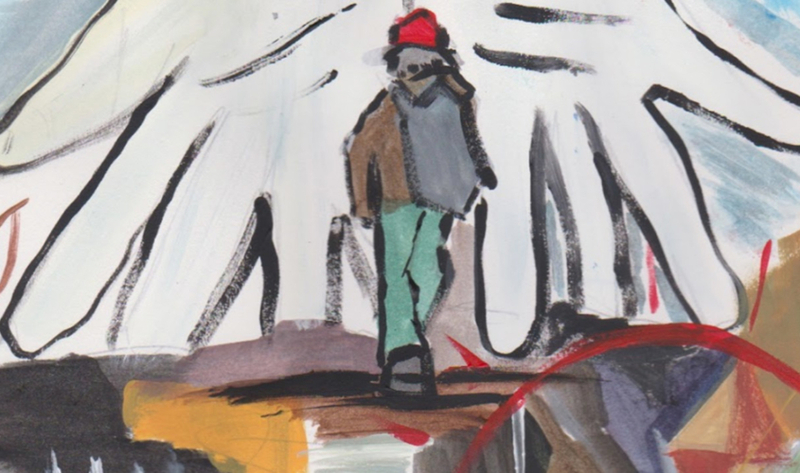 Calvin Guy, Danny Dotson, Andrew Gavins and Brian Graham each told how he had made poor choices and ended up homeless, and that they were not sure how he could reclaim their life. Each recounted that the Father McKenna Center, and the companionship of Cortez, and others on the Father McKenna Center team, had made all the difference in their lives. Heartfelt songs and spirituals sung by the cast reinforced their stories. 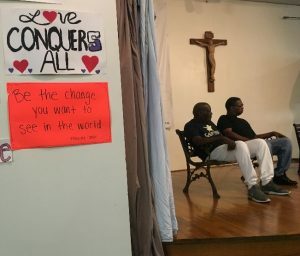 Th e Center plans to shorten the production to a 20-minute presentation that could be staged for a parish or other groups to illustrate the struggles of those who are temporarily homeless and to demonstrate the impact of The Father McKenna Center on those who choose to make changes in their lives. Please contact Kim Cox if you would like to schedule a performance.